PURCELL, Tortola, VI – Over the past three weeks customers of Delta Petroleum can attest to be paying less for more as the price for gasoline at those stations across the Territory has been on a constant downward spiral especially over the past three weeks. This was confirmed by the General Manager of Delta Petroleum Mr Bevis A. Sylvester in an exclusive interview with this news site. He explained that the prices for gasoline on the global market have been dropping and are promising to drop even further, a trend Delta Petroleum will follow for the sake of its customers. He explained that Delta has an excellent stock measurement system which allows them to track old from new stock. “Delta of course moves prices according to our stock. Once our ship comes in prices normally shift especially if the old stock is used up, once we get to the new stock the prices shift,” said Mr Sylvester. He said that especially for the past two deliveries prices have been consistently dropping. “What’s important for the public to know is that as prices fall or increase Delta would be responding to that appropriately,” he noted. Three weeks ago the price per gallon of gasoline was at $4.65. From then to now their drop in price has been noted to be $4.50, then to $4.24 and as today November 18, 2014 it was $4.16 per gallon and should the next shipment be purchased at a lower price, it would be reflected at the machines at Delta Gas Stations across the Territory. Along with doing their part to aid the economy of its customers’ pocket more can be expected from Delta Petroleum towards the end of this year through a number of promotions that are on the table and one already on the roll. This year the fuel giant of the Virgin Islands has teamed up with one of the largest fund-raiser non-governmental organization in giving back to the community, Rotary Club of Road Town. “You know this year Delta has teamed up with Rotary with the raffle and that would be drawn on Christmas Eve right here at Delta Petroleum and Delta for their customers would be giving out ticket for gas and that’s a promotion that would be coming out shortly,” said Mr Sylvester. He thanked the Rotary Club of Road Town for inviting Delta Petroleum for being a part of the promotion this year one which has already seen big winnings being given out as the draws have commenced. The first early bird draw winner hails from Huntum’s Ghut who was confident that her purchasing of her ticket would have brought her good rewards. She has since received her cash prize of $1,500. 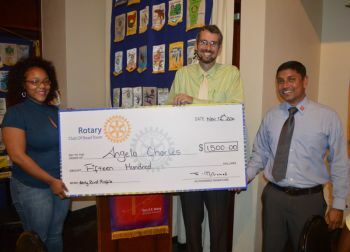 She is Ms Angela Charles. The grand draw for the top prize, a fully loaded 2015 Nissan XTrail, will take place on December 24 at Delta Petroleum, Pasea. There will be another early bird draw for $1,500 on December 6, 2014 outside Riteway, Pasea. Previously, proceeds from the annual raffle have funded the purchase of dialysis machines for Peebles Hospital. The club is also heavily involved in other community projects such as the provision of playground equipment, home restorations, the provision of dictionaries for primary schools, Kiddies Fiesta and health fairs where testing is offered to the public for free. Raffle tickets are being sold at Nagico Insurances, LIME, Mulligans, D’ Best Cup next to Scotiabank or from any member of the Rotary Club of Road Town. So, electric bills should also reflect this savings to the consumer?? So lets see what electricity will be telling us now. We should see atleast a little drop on them HIGH light bills we've been getting. Thanks for making it public Bevis. That is why our family stop going by Kettle and Bolo at the round-a-bout because their prices never go down! They all claim to be god fearing people is what make this so disgusting. We need inspectors to go around to ensure that gas owners adjust their gas pumps when the price of oil goes down. Kudos to Bevis for treating Delta's customers fairly. Those others they only hear when the price of oil go up, they raise their price immediately, but they lose their hearing when it go up. I am giving Bevis my business, because he gives back. Those others are a set of unscrupulous bastards . Bevis you just got a new customer. if the gas prise is not $3.50 as low ,then gas prise still high in the B.V.I. BIG THANKS TO THAT WATER AND SEWAGE GUY WHO CALL GADITZ EVERY MORNING WITH HIS WORLD GAS REPORT PUTTING PRESSURE AND THE GAS STATIONS. THANKS MY BROTHER YOU ARE OUR TRUE REPRESENTATIVE. WITHOUT YOUR PRESSURE IT WOULD NEVER HAPPEN, THE PRICE WONT GO DOWN. Hope he keeps it low then there will be only one place to buy gas from in the bvi!